On the surface, the “Honor (Don’t Appropriate) Yoga” event seemed well-intended, well-crafted and much needed. It is well established that yoga asana studios in the United States have become the wealthy, white woman’s playground, projected to pull in $11.6 billion in 2020. Since profiting from stolen resources is a signature of colonization, a conversation about decolonizing yoga seems to be in order. 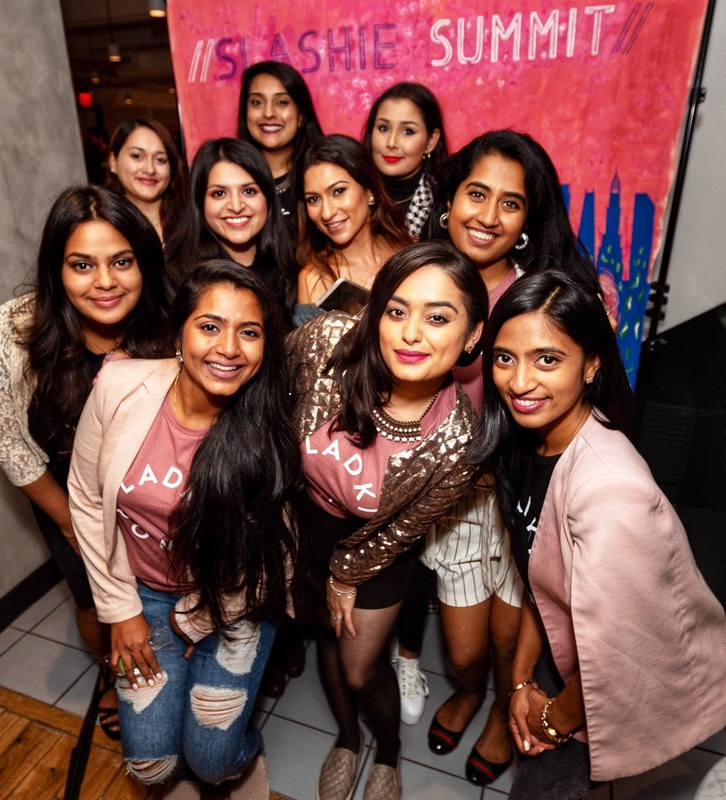 The Honor Yoga summit was organized by Susanna Barkataki, a person of British and Indian descent, who has gone through yoga teacher training but doesn’t reference any connection to a guru or lineage. She also consults for a number of “yoga organizations,” including Yoga Alliance (make a mental note here). If you scroll through the homepage, you’ll see some people of color—and a few appear to be of South Asian descent, so it seems convincingly inclusive. But if you dig deeper, putting aside the troubling assumption that South Asians innately know how to honor dharma traditions, you’ll find that this is only for show. In fact, it seems that the organizers exclusively included people without connections to lineages and traditions, with one exception. And that individual stepped down from the summit after hearing Hinduphobic and imperialist views being asserted and welcomed by other speakers including Barkataki herself. During the summit, we listened to the speakers as our stomachs churned. Barkataki corroborated—without any substantiating evidence from critical indigenous scholars—that Sanskrit has colonial roots. She also claimed that the practice of yoga is personal, endorsing Instagramming naked yoga if it’s consistent with one’s practice. She didn’t seek the qualifications of a speaker who claimed to be translating Sanskrit on her own as a way to combat oppression—the list goes on. Meanwhile, their Facebook page was flooded with well-known Hinduphobes. So what does this have to do with colonization? Let’s start with the claim that Sanskrit is a colonizing language. There has been a consistent, unified effort by the Western Yoga Industrial Complex (e.g. 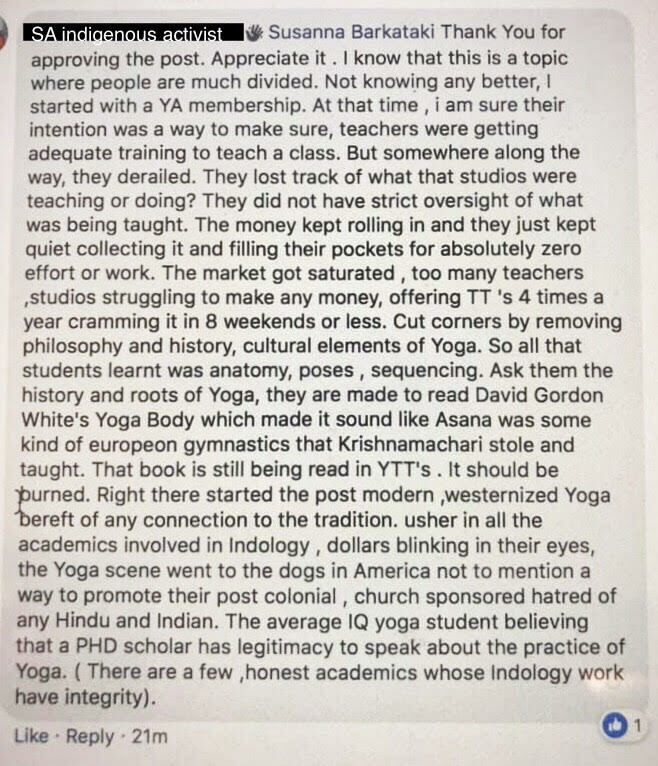 Yoga Alliance), in collaboration with white and Indian scholars who study Hinduism through a Eurocentric lens, to delegitimize Sanskrit based on easily-debunked Euro-American theories. Not only do they actively exclude indigenous Sanskrit scholars from this conversation, but they also manipulate the truth by insidiously co-opting social justice vernacular. Notably, the propagators of this self-serving accusation are all native English speakers, the language of India’s actual colonizers. They’re not advocating for the scriptures to be translated into the local Indian dialects of the people they claim are oppressed by Sanskrit. Their solution is to delink Sanskrit texts from yoga altogether. The Sanskrit slandering is furthered when Barkataki—a “decolonizing expert”—supports translating Sanskrit on one’s own, without referring to an indigenous translation, under the pretense that “Sanskrit is oppressive.” The summit reinforces a narrative that Sanskrit is both colonizing and also not substantial enough to be worthy of rigor. This kind of paradoxical messaging is a common mark of Hinduphobia. Barkataki’s comment about Instagram feeds the distorted notion that yoga is about an individual’s body image performance. 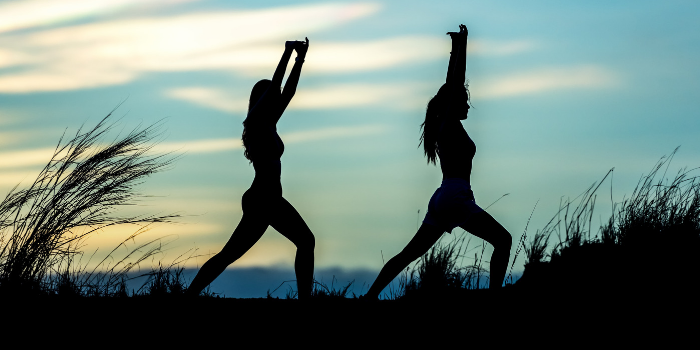 Three big critiques of the yoga industry are that it caters to white women, is prohibitively expensive and promotes selfishness—not a social good. Authentic yoga—not just asana but the entire knowledge tradition from which it emerges—is available to all sincere seekers, is not connected to capitalism and is not about celebrating our bodies, but rather, about our relationship to the planet. The idea that yoga is available to make white women feel better is simply a reinvented colonial trope: Spiritual India exists to assuage the delicate sensibilities of British memsaabs who are overwhelmed by the surrounding swarms of barbaric natives. The difference is that today’s version is woke. Thinking about racism gotcha down, Becky? Go to a yoga class. We’ll keep those pesky natives away so you can self-care in peace. Instagram it, goddess! Unfortunately, this isn’t an exaggeration. 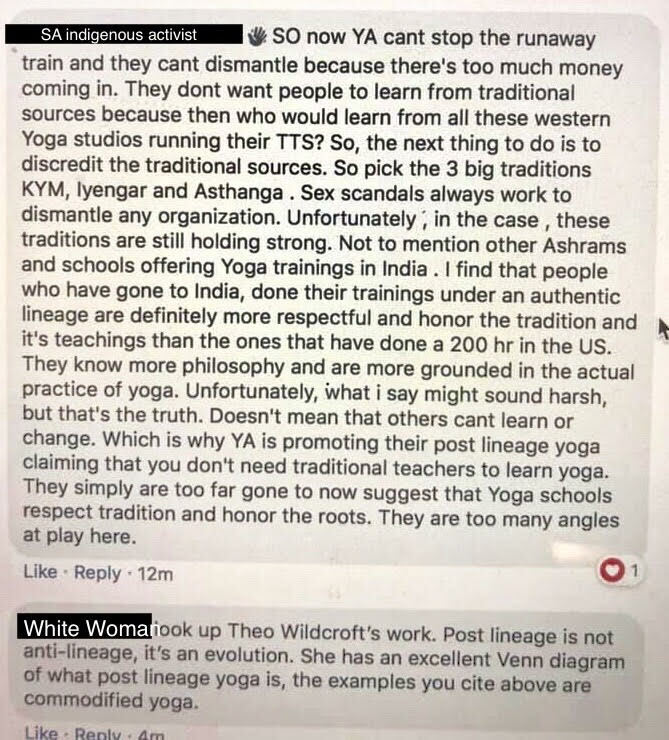 Stories keep pouring in of South Asian women getting kicked out of yoga studios for things as simple as suggesting that Sanskrit be honored. Although she is worried about “sounding harsh,” you’ll notice that the South Asian activist is actually very polite. She simply shares a critical analysis of the Yoga Alliance from the perspective of an indigenous practitioner. You’d think that the leader of a summit dedicated to decolonizing yoga would welcome such a respectful, detailed analysis of a powerful colonizing entity. Not Barkataki. She consults for Yoga Alliance, and several observant critics (in another Facebook group) noticed that the materials for this summit were similar to Yoga Alliance branding. What happens next is surprising and yet not. Barkataki blocked further commenting, muting the concerns of an indigenous lineaged practitioner without transparency about which guidelines were violated or who had reported it. Once again, a South Asian woman was silenced for speaking her truth. In fact, we noticed that not only was the Facebook page poorly moderated, but posts from other indigenous knowledge stewards and decolonizing activists were being deleted. If it weren’t for some screenshots we took, we would have no evidence that this had happened. It’s safe to assume that the offended parties are not stewards of indigenous knowledge. It’s also safe to assume — based on not living under a rock — that this is yet another case of white fragility. The protection of yogic and Vedic traditions should not be compromised to fit white expression or cater to their fragility. In the end, the appropriation was only given lip service. It’s clear that Barkataki and the summit’s experts were ill-equipped to host a critical, inclusive space that was genuinely decolonizing. Barkataki willfully ignored the critical advice of two indigenous women who had taught her about decolonization. This is uncomfortable, disruptive work. In a world where yoga has been commodified and reduced to “self-care” asana and personal healing, it is crucial to question all dominant assumptions with absolute commitment. Anything less will end up causing further damage and will confuse folks who sincerely want to decolonize and don’t know how. The Facebook group for this summit had around 5,000 members. The damage caused by the disseminated misinformation—due to Barkataki’s willful resistance to seeking authentic experts—will multiply when those 5,000 people return to their communities equipped to spread this misinformation and these flawed analyses. This will only exacerbate the situation. All in all, this was a debacle. Here, we have only scratched the surface. As we continue to recover from the shock of such blatant hypocrisy, erasure, and recolonization, we will certainly find and share more lessons to be taken from such experiences. Thankfully, we are deeply steeped in our dharma practices, which help us move through this space together. If a yoga decolonizing summit doesn’t center decolonizing teachers with an authentic lineage, it is actively advancing colonization. If a yoga decolonizing summit is led by someone who has close ties to Yoga Alliance or any other for-profit organization that is a part of the Yoga Industrial Complex, it is actively advancing colonization. If a yoga decolonizing summit doesn’t acknowledge, address and dismantle Hinduphobia, it is actively advancing colonization. If a yoga decolonization summit uses the ethnicity of South Asian people as a proxy for indigenous knowledge expertise, it is actively advancing colonization. By “legitimately” conflating identity with positionality, this also undermines the credibility of authentic stewards moving forward. If a yoga decolonization summit is more concerned with being a safe space that caters to white comfort and white savior complex than a brave space that centers indigenous knowledge tradition, it is actively advancing colonization. If the leaders of a yoga decolonization summit don’t have a sophisticated grasp of how diversity and inclusion vernacular can be co-opted to further the colonization of indigenous practices, they will inevitably advance colonization. Our intention is not to dissuade genuinely interested individuals from decolonizing yoga. We are deeply committed to identifying and peeling away all of its layers. Decolonization is a long, painful, continuous and confusing process. We will keep critiquing these events and conversations because the colonization of yoga and Hinduphobia are deeply entrenched, and their mechanisms are often imperceptible to most people. Our commitment is to keep shining light, with love and reverence.